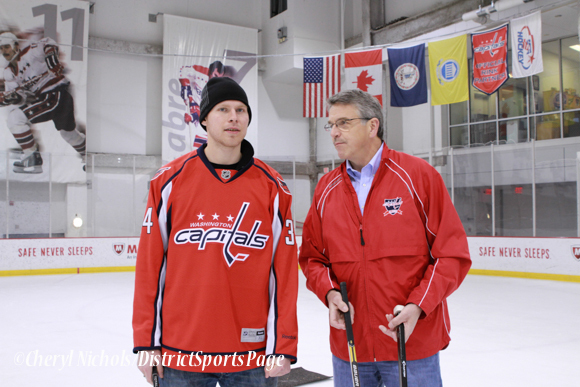 FEBRUARY 25, 2015 – Washington, D.C.: Washington Capitals fans can now win right alongside the team with the launch of CapTrick, the all-new, official Caps fantasy hockey game at DailyMVP. 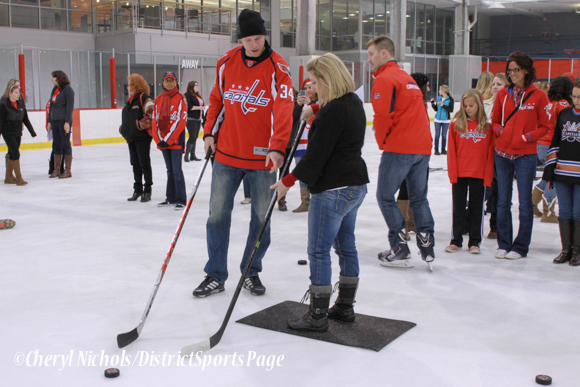 Open for play during all Capitals games – home and away, including the playoffs – CapTrick enhances the excitement of the live game for fans at Verizon Center, as well as for those following along from home. Prizes are awarded instantly at the end of every period. Available exclusively through DailyMVP, CapTrick is available to play for free at DailyMVP.com/CAPTRICK, or through the DailyMVP app using the promo code “GOCAPS.” Fans can enter to play CapTrick before the start of a period by simply selecting three Caps players for their roster. 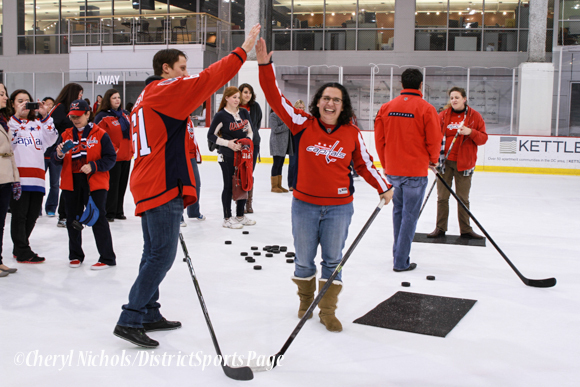 At the end of each period, participants with the highest scores based on their players’ performances will instantly win in-arena prizes, such as concession and merchandise certificates, or earn Monumental Rewards points to redeem online for Capitals gear or tickets to future Capitals games. Prize codes appear automatically on the fan’s phone and are also sent via email within a minute of the period ending and can be redeemed immediately. More than 60 prizes will be given away during each game. The CapTrick participant with the overall highest score across all three periods will win the grand prize of a $50 merchandise coupon or 5,000 Monumental Rewards points. The flagship fantasy sports brand from TopLine Game Labs, DailyMVP offers short-duration fantasy games designed for play anytime, anywhere, on any device. Along with CapTrick, DailyMVP offers daily fantasy sports contests for football, baseball, hockey and basketball. Easy to set up via the browser-based platform or iOS app, DailyMVP allows users to pick the players they want and challenge friends or random opponents in head-to-head challenges or in larger contests. For more information on CapTrick, please visit DailyMVP.com/CAPTRICK. 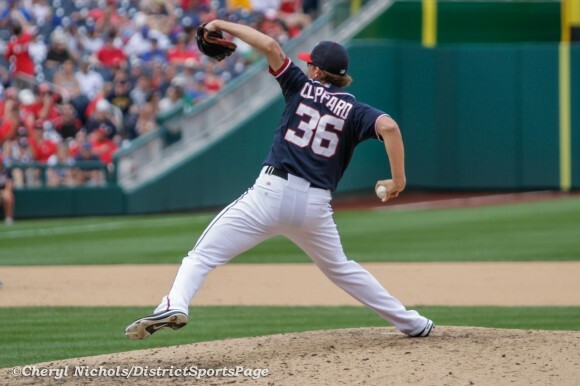 Relief pitcher Tyler Clippard seemed as surprised as Washington Nationals fans on Wednesday evening when the trade with the Oakland Athletics was announced. 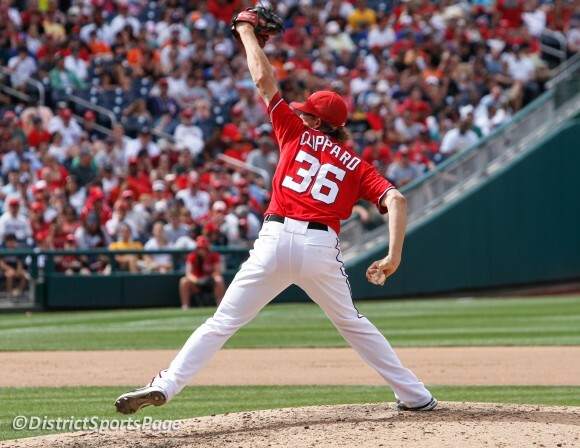 Nats fans immediately shared their displeasure of the trade on social media as Clippard is a fan favorite. 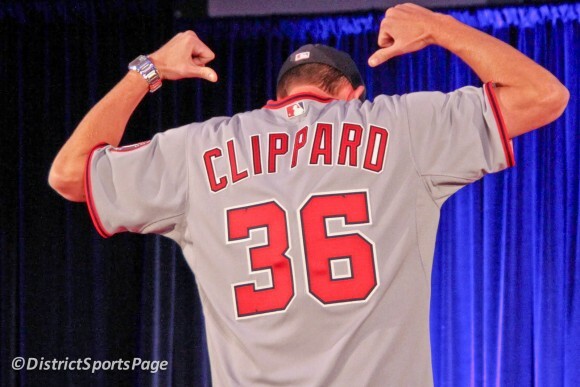 Shortly after the trade last night, Tyler Clippard took to Twitter to thank the fans. He even posted the “Peaches” video by The Presidents of the United States to long-time fans, which was Clippard’s warm-up song prior to “Ready or Not” by the Fugees (which I think was one of the best warm-up songs ever!). 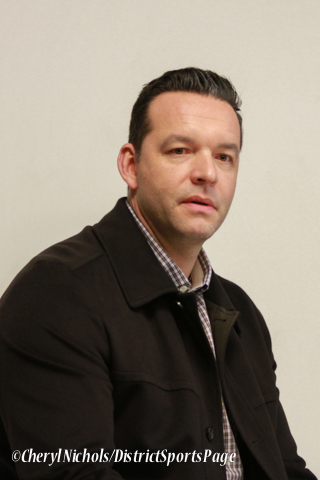 See other DSP opinion pieces regarding the trade. Just got traded to Oakland! Crazy night! I’m gonna miss all my boys, this is the hard part of the business! Very excited though! I loved every second of my time in DC, through the ups and downs the good and bad, every second was wonderful. 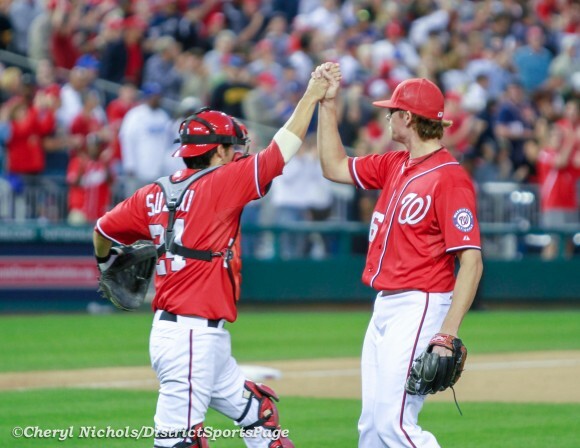 Thanks forever Nats Nation! 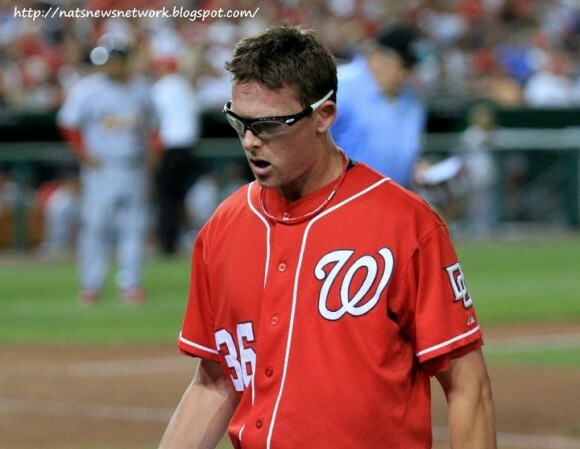 I’ve literally taken thousands of photos of Clippard over the years. It took some practice to get Clipp’s full unique delivery, which I nicknamed “Windmill” since both of his arms move around. Here are a few photos to view and reminisce. 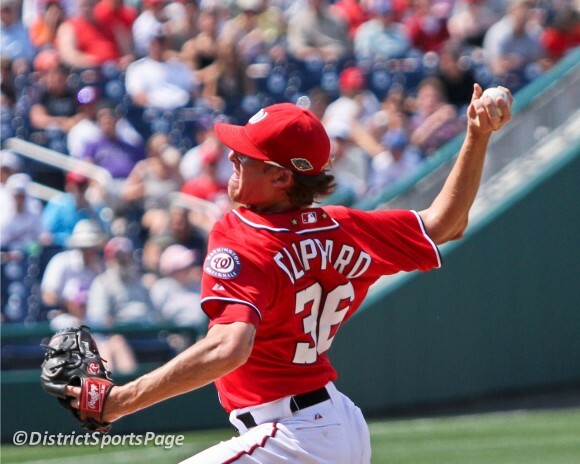 Wishing Clippard the best of luck with his new team, but he will definitely be missed in DC. from 11:00 a.m. to 5:00 p.m. at Walter E. Washington Convention Center. 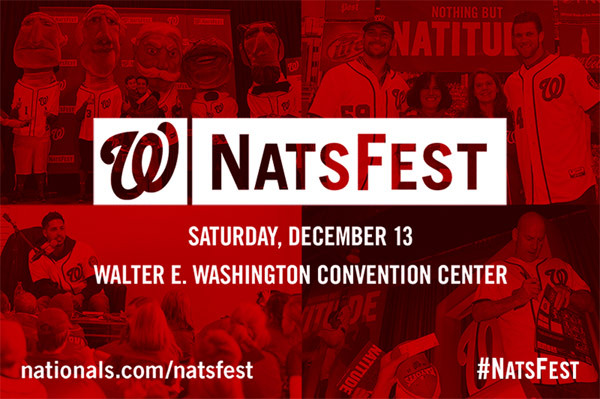 Season Plan Holders will have exclusive access to the event for an entire hour (10:00 a.m. to 11:00 a.m.) before #NatsFest opens to the general public at 11:00 a.m.
Tickets and autograph vouchers will go on sale on Wednesday, October 29 at 9:00 a.m.
Tickets purchased in advance at will cost $20 for adults and $10 for children 12 and under, with prices increasing to $25 for adults and $15 for children 12 and under the day of the event. 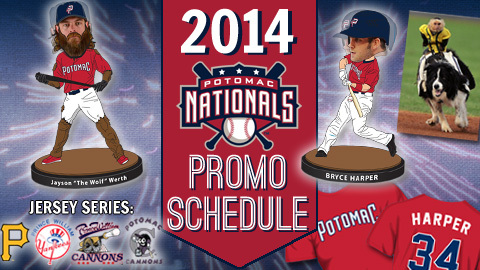 Season Plan Holders will receive an information about purchasing NatsFest tickets at a discounted rate. A full schedule of events will be available in the coming weeks. 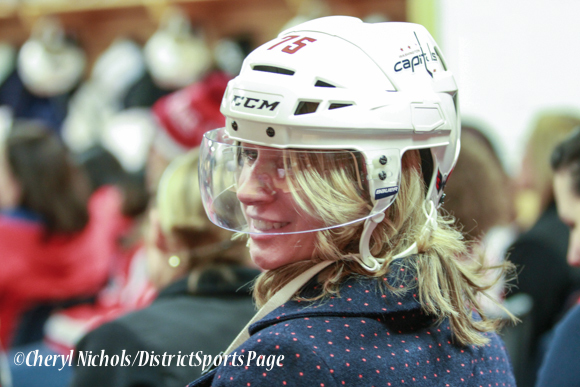 The Washington Capitals hosted the sold-out Hockey ‘n Heels on Nov. 13, at Kettler Capitals Iceplex in Arlington, Va. 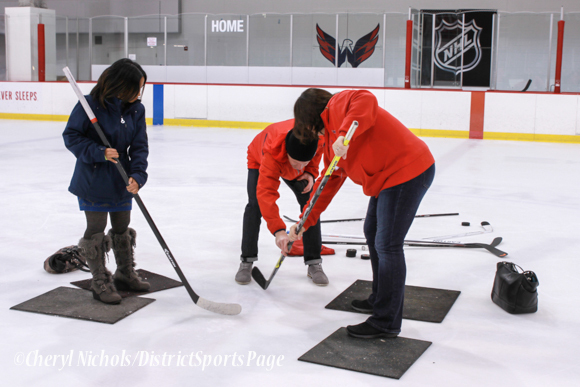 The event was held exclusively for Club Scarlet members in partnership with 97.1 Wash FM and featured instructional sessions and on-ice demonstrations targeted towards the Capitals female audience. 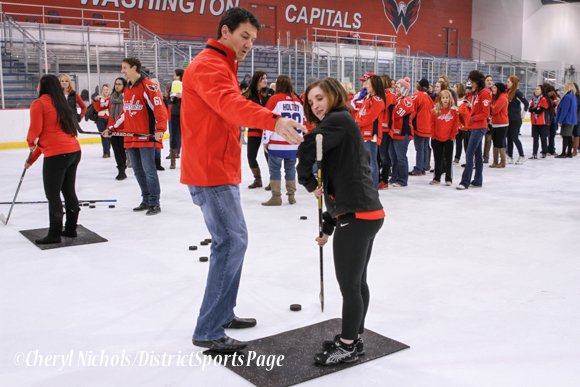 The first half of the night was divided into three sessions of on-ice demonstrations from current and former Capitals players and coaches. 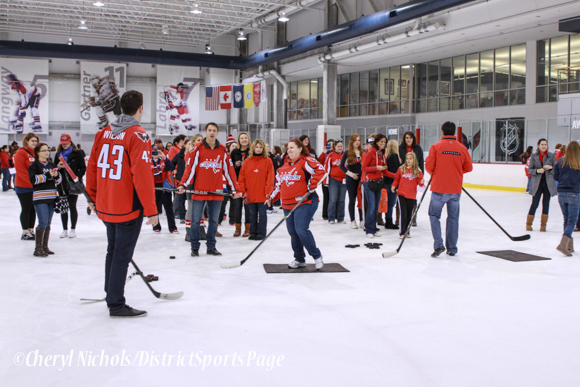 Defenseman Steve Oleksy, forward Tom Wilson and former Capital/current Comcast analyst Alan May instructed participants on shooting skills. 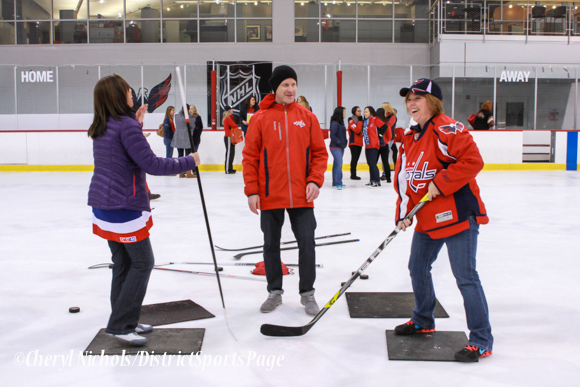 Assistant coach Blaine Forsythe instructed women on face-offs while defenseman Alexander Urbom and former Capital Paul Mulvey covered stick handling and passing skills. 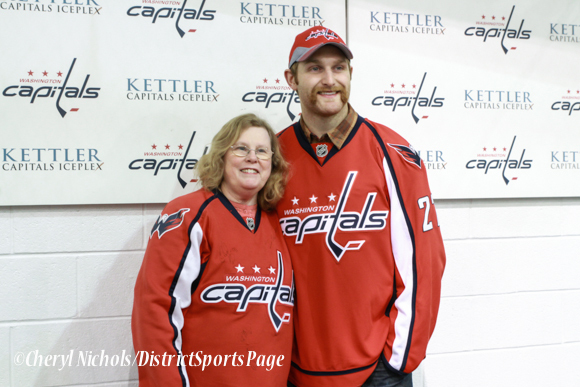 Attendees also had the opportunity to take a photo with defenseman Karl Alzner during the event. 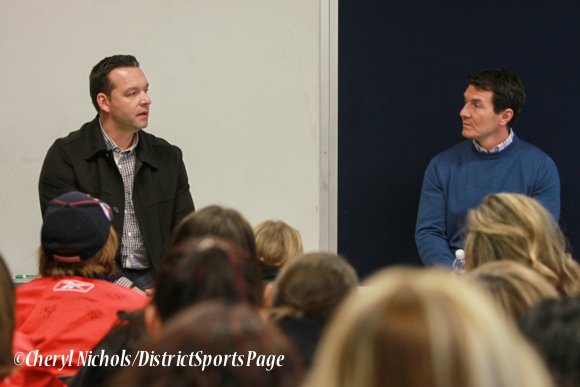 Off-ice presentations included a Q & A with head goaltender coach Olie Kolzig, along with May. Video coach Brett Leonhardt conducted a video session to provide attendees a peek into how the team prepares for upcoming games by watching game footage. 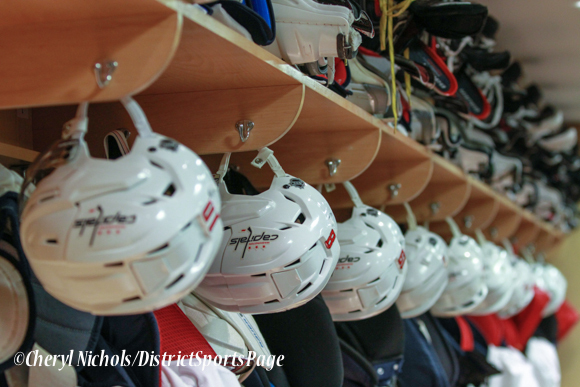 The head equipment manager Brock Myles discussed equipment worn by the team during an equipment session in the Capitals locker room. 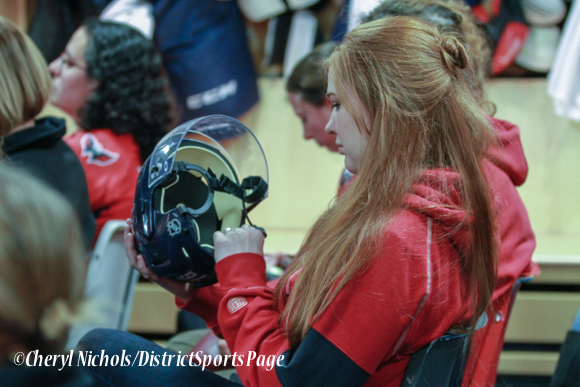 Women were able to try on an official helmet and see equipment up close. Founded in 2009, Club Scarlet is a fan club for women designed to provide more information, events and networking opportunities for the team’s population of female fans. To learn more about Club Scarlet visit http://www.scarletcaps.com/. The District of Columbia has basketball fever and everyone is happy that the Wiz Kids are back in DC tonight to host the Pacers for game six of the NBA playoffs. Check out the fun video that MSE released. Warning: This tune is catchy and will stick in your head all day (that is not necessarily a bad thing!). The video features Monumental Sports & Entertainment majority owner and chairman Ted Leonsis, MSE partners, District of Columbia mayor Vincent C. Gray, District of Columbia councilwoman and mayoral incumbent Muriel Bowser, District of Columbia councilman Jack Evans, Bullets alumni Gheorghe Muresan and Bob Dandridge, Wizards Radio Network broadcaster Dave Johnson and analyst Glenn Consor, Fox News’ Brett Baier, Comcast SportsNet’s Chris Miller, Ron Thompson, Gary Williams and Michael Jenkins, and WUSA 9’s Derek McGinty, Jan Jeffcoat, Topper Shutt and Dave Owens. 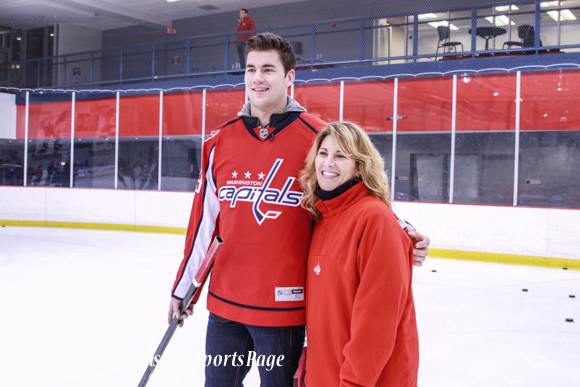 The video also features members of the D.C. Fire Department and Emergency Services, the D.C. Metropolitan Police Department, the United States Army Band, G-Wiz, the Wizard Girls, Wizards fans and MSE staff. With seven games left on the schedule, every game is “must win” for the Washington Capitals. On Tuesday, at the Verizon Center no less, the Caps faced a Western Conference team that is in very much the same position. The result: the Dallas Stars spanked the Caps 5-0, all but eliminating the Caps from any further playoff discussion. Dallas broke the ice in middle of a sleepy first period. Tyler Seguin won a puck battle behind the Caps net with John Carlson and fed Jamie Benn at the top of the left wing circle. Benn’s shot headed for Jaroslav Halak’s crest, but Seguin did nice work to drive the net and tipped the puck past Halak on the glove side to put Dallas up 1-0. The Stars added to that lead in the second. A terrible line change led to a 2-on-0 and Ray Whitney faked Halak out of his skates for his ninth goal of the season. Another defensive breakdown 34 seconds later allowed Dustin Jeffrey to register his first goal of the season, sending Halak to the bench replaced by Braden Holtby, more a wake-up call to his teammates, who left him out to dry all night long. Dallas added insult to injury in the third, with Jeffrey scoring his second of the game, on a feed by the veteran Whitney. As if that wasn’t enough (and it was more than enough) Ryan Garbutt tacked on a short-handed goal with 5:10 left in the contest. Caps Captain Alex Ovechkin was asked if he had an answer for the reoccurring mistakes. The Capitals have six games left, likely needing six wins, with their final two games hosting Western Conference powerhouses Chicago and St. Louis. You’re never eliminated until you’re mathematically eliminated, but even the most optimistic supporters have to be prepared at this point for this team not qualifying for the playoffs. Tonight was the 220th consecutive sellout at the Verizon Center and the fans let the Washington Capitals how they felt about the loss. 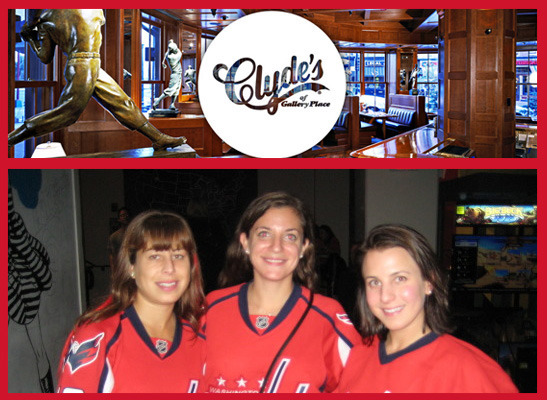 Club Scarlet will be hosting a brunch on Sunday, March 2, at Clyde’s of Gallery Place from 10:30 a.m. – 12:30 p.m. before the Capitals take on the Philadelphia Flyers. Tickets are $20 and include a delicious brunch buffet, plus a drink ticket valid for one mimosa (does not include game ticket). There will also be a cash bar available for other beverage purposes. This event is all-ages. Check-in begins at 10:15 a.m. Club Scarlet will be raffling off some great autographed Caps items, including a pair of tickets to the game that day! 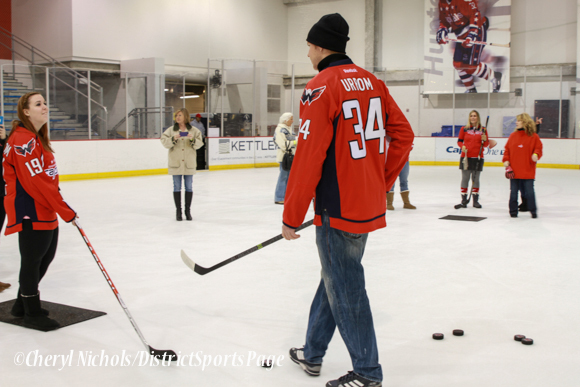 Come and mingle with other Scarlet members before heading over to Verizon Center or stick around to watch the game at Clyde’s! Click here to purchase tickets* (promo code: BRUNCH). A confirmation email with additional details will be sent the week of the event. Tickets are expected to sell out, so buy yours today! * Please note that brunch tickets do not include a ticket to the Caps game. 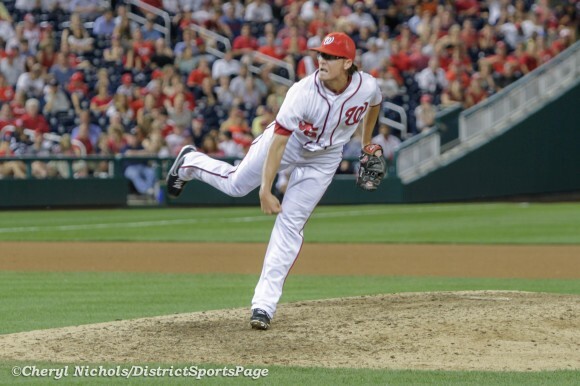 The Washington Nationals today released new details about 2014 NatsFest, taking place at the Gaylord National Resort and Convention Center on Saturday, January 25, 2014 from 11:00 a.m. to 3:00 p.m. Season Plan Holders will have exclusive access to the event for an entire hour (10:00 a.m. to 11:00 a.m.) before NatsFest opens to the general public at 11:00 a.m. For more information on becoming a Season Plan Holder and receiving exclusive benefits like this, visit nationals.com/2014. 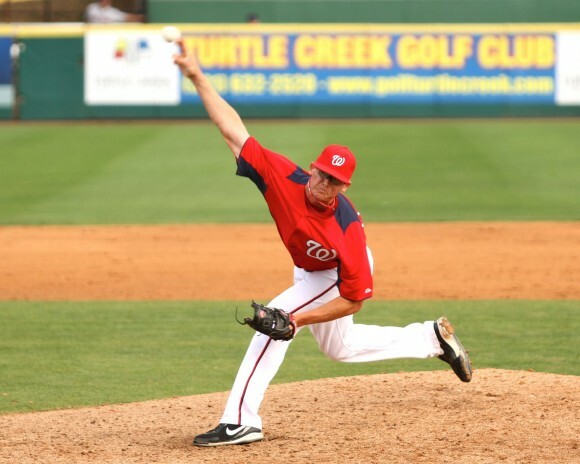 More than 20 Nationals players and team personnel are expected to attend the fun-filled baseball festival including* Tyler Clippard, Ross Detwiler, Danny Espinosa, Gio Gonzalez, Scott Hairston, Bryce Harper, Ryan Mattheus, Tyler Moore, Ross Ohlendorf, Anthony Rendon, Tanner Roark, Sammy Solis, Steven Souza, Jr., Denard Span, Craig Stammen, Drew Storen, Stephen Strasburg, Zach Walters and Jayson Werth. Fans will also have the first opportunity to meet three of the team’s newest additions, pitchers Doug Fister and Jerry Blevins, and manager Matt Williams. Nationals President of Baseball Operations and General Manager Mike Rizzo as well as team broadcasters Bob Carpenter, F.P. Santangelo, Charlie Slowes and Dave Jageler are also expected to be in attendance. 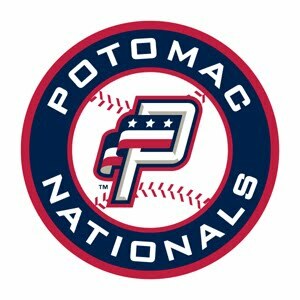 Tickets purchased in advance at nationals.com/natsfest will cost $20 for adults and $10 for children 12 and under, with prices increasing to $25 for adults and $15 for children 12 and under the day of the event. Season Plan Holders will receive $5 off the entry fee when tickets are purchased in advance ($15 for adults, $5 for children 12 and under) or on the day of the event ($20 for adults, $10 for children 12 and under). Please note that all autograph vouchers are SOLD OUT; autograph voucher holders are encouraged to visit nationals.com/natsfest for important information. For directions and parking information, including pre-pay parking options, visit the National Harbor website at http://nationalharbor.com/directory-parking/.